After Ireland's defeat by France in Paris, it's now time for Stuart McCloskey to be unleashed and let loose on the Six Nations. Some of the younger talent in the country deserve the chance to impress and the Ulster centre has been knocking at the door by virtue of his consistent performances at provincial level this season. 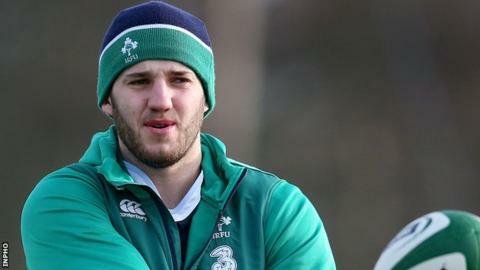 It takes time to adapt fully to international rugby but you have to learn by experience and there is maybe a chance for the likes of Stuart to show Joe Schmidt what he can do over the next few weeks. Also, with Jonathan Sexton increasingly prone to injury, Paddy Jackson should be afforded the opportunity to nail down a position as the regular back-up at fly-half. It's England up next for Ireland and if we lose at Twickenham, then regardless of what happens against Italy and Scotland, it won't have been a very successful Six Nations for the reigning champions. You can't make 10 changes for a game like that, but you can maybe make one or two, keep the other guys on their toes, and then maybe make a few more for the match against the Italians in Dublin. At half-time in Paris, I couldn't see the French team getting into the game at all but they had their purple patch and the Irish scrum just creaked. I said before the tournament that the Six Nations is not usually a time to experiment, but now that Ireland's chances of winning it have probably gone, maybe it is time to shake things up a bit. The centre partnership of Jared Payne and Robbie Henshaw is not busting any holes and giving the team a bit of go forward. I think that's what's missing. If McCloskey was given the number 12 shirt against England or Italy it would make those guys think that they would have to buck up their ideas and put in some better performances because at the moment there is no-one challenging them. Stuart would offer more penetration at centre and give you that in abundance. Jared has often played full-back for Ulster so there is always the possibility of moving him to the number 15 shirt. The outcome against the French proved what I thought beforehand, that the bench was just not strong enough, especially in the back line. When Sexton went off injured, Ian Madigan came off the bench and kicked the ball straight into touch, gave them a penalty and that put France on the front foot. You have to question whether he is used to dealing with pressure situations given that he is usually sat on the bench for Leinster, coming on at 12, 15 or 10 at some stage during the game. For me, you want to have players coming on who do not weaken the team and you have to have a reliable replacement number 10 who knows exactly what he has to do. Fergus McFadden was another replacement who had no impact on the game whatsoever. Stephen Ferris was speaking on BBC Radio Ulster's Sportsound programme.